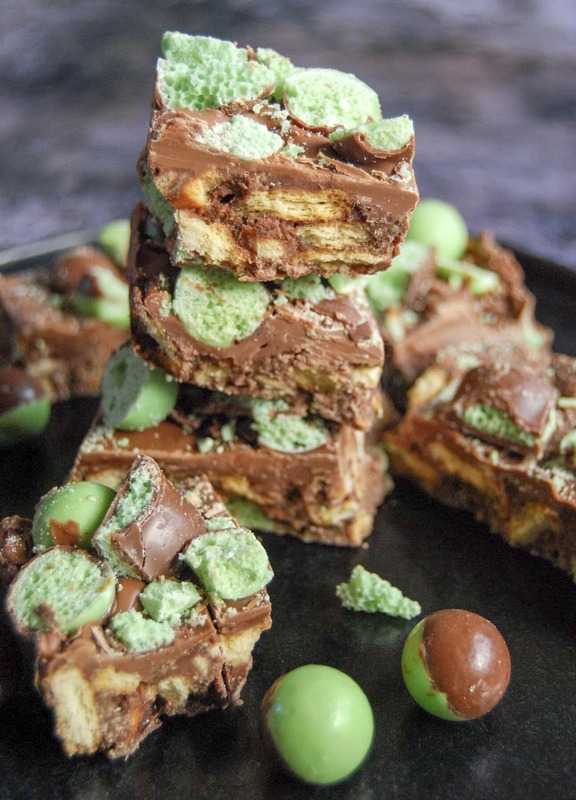 An incredibly easy no bake mint Aero traybake with crushed biscuits, mint Aero bar, and mint Aero bubbles! An quick and easy recipe perfect for parties, bake sales or a weekend treat! 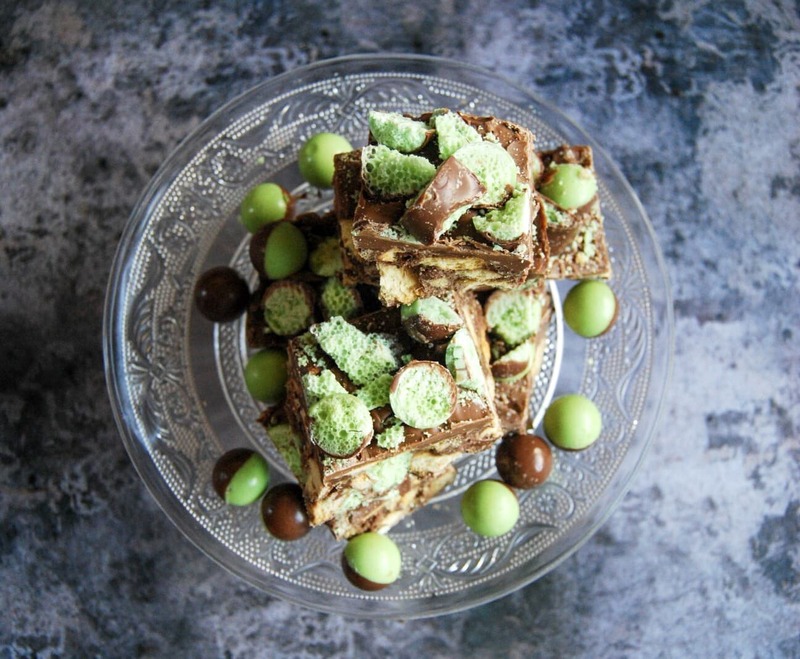 I feel that I should introduce this recipe with a health warning…it’s highly addictive! Even more dangerously, it’s very quick and easy to make. The trouble is, it tends to disappear extremely quickly! No-one can seem to resist it. 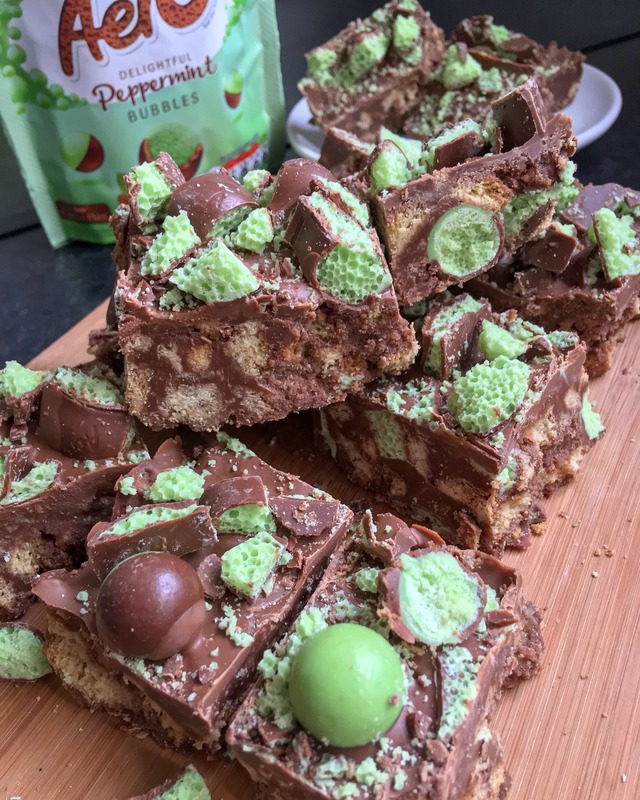 I usually make this as a Malteser traybake but one day I decided to give it a try with my favourite chocolate – mint Aero and mint Aero Bubbles. To say this went down well with everyone would be an understatement. I only got one small piece! My boys loved it. Pour into a lined tin and smooth the surface with the back of a spoon. Then all you need to do is pour over more melted chocolate and decorate with Aero bubbles. Then it’s time for the hard part…leaving it to set in the fridge for a minimum of 2 hours – sorry! It is worth the wait though, trust me. 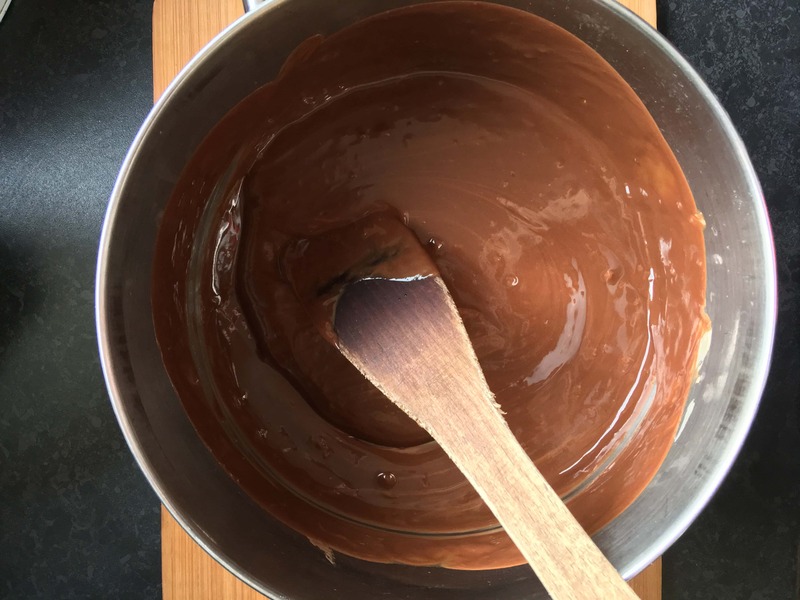 I tend to use milk chocolate in this recipe because my family prefer it, but if you wanted to you could all dark chocolate or a mixture of half milk and half dark. I haven’t tried it yet, but I can imagine an all dark version would make a good “grown up” version. If you try it, let me know what you think! If you make this, I would love to see it! Take a picture and tag me on my Facebook page, Twitter, or Instagram! 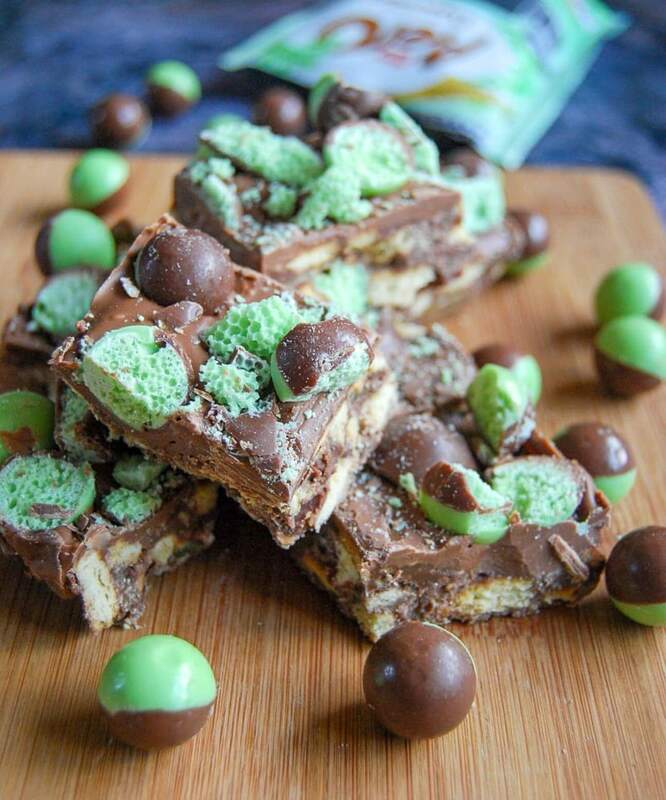 An easy no bake chocolate traybake loaded with Mint Aero bubbles and chunks of Mint Aero bar! A mint chocolate lover's dream come true! Melt the butter, chocolate and syrup together in a large saucepan, stirring occasionally. Once everything has melted and is smooth, remove from the heat. 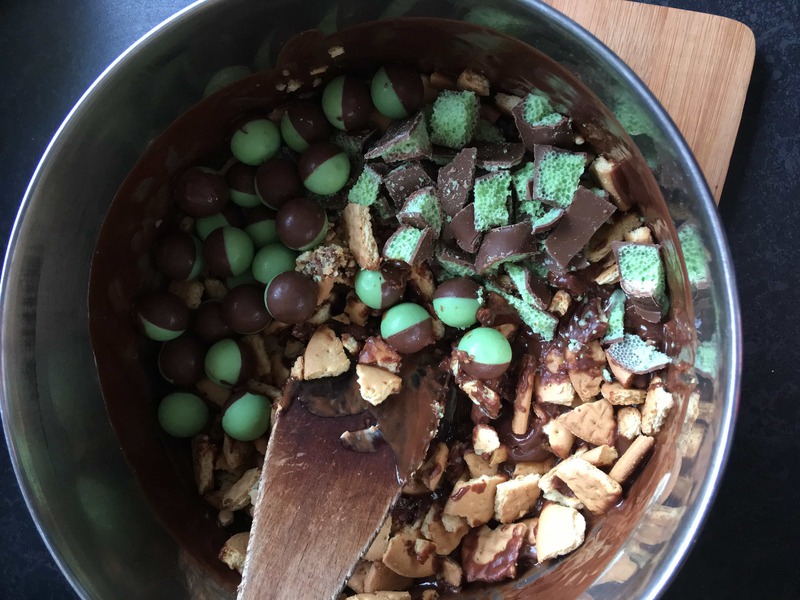 Leave for a minute before stirring in the crushed biscuits, chopped mint Aero bar and the Aero bubbles. Tip into a lined 22cm square tin and level out the top as best as you can. Pop in the fridge while you melt the chocolate for the topping. Melt the 150g chocolate in a heatproof bowl set over a pan of simmering water. Remove the traybake from the fridge and pour the melted chocolate all over the top, smoothing it out with a spatula to get the chocolate into the corners. Top with the chopped Aero and Aero bubbles. Place back in the fridge for a minimum of 2 hours or until set. Once the traybake is set, cut into bars and watch it disappear! Umm… looks totally deeelish! I probably shouldn’t have seen this when I need to lose some post-holiday icecream/doughnut weight! I like the inner green bubbles! Looks sooooo good! Gotta try it! It’s so good and unbelievably easy! Thanks Lindsay! 🙂 I know just how you feel…I feel I have a constant battle between my love of sweet things and wanting to fit into my jeans! Yum! I don’t know what Aero Bubbles are, but that sure looks good! I just dribbled over the keyboard looking at this. 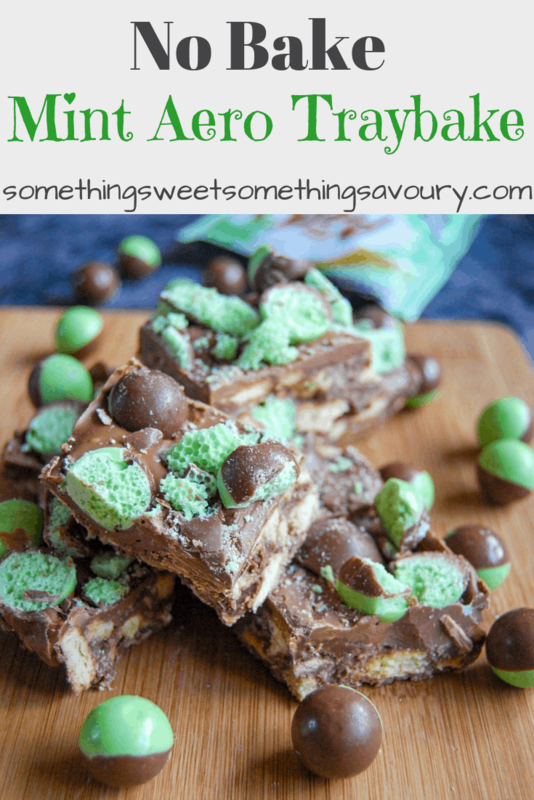 Even though I’m not a fan of mint, I do like the minty aero bars – great idea! Thanks 🙂 It’s a gorgeous recipe! Hi, how many people would you say this quantity would do? It’s hard to say really, you can always cut it into smaller pieces if you need it to go further. But if you’re making it for more than 10-12 people, I would probably double the recipe. It’s very addictive!